Art Gallery Cards: Congratulations To One of Our Younger Stampers! One of our stampers may be from the younger set but as a 10 year -old, Aubrey is quite accomplished, not only stamping but this talented and motivated young lady was honored this year for her citizenship and her academic and literary accomplishments. 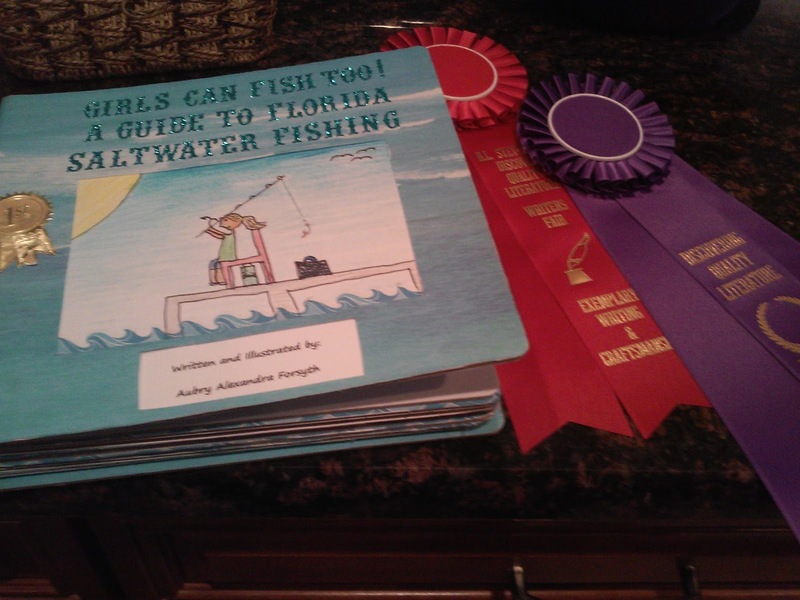 Pictured are Aubrey's awards for her original book. I love that the book she has written and illustrated is titled, "Girls Can Fish Too, a Guide to Florida Saltwater Fishing". Yay, girls!!! Aubrey's book is so impressive--the art, the knowledge! Wow! Evidently others were impressed too, as you see her awards for exemplary writing and craftmanship, as well as quality literature. We're proud of you, Aubrey! Your book is publisher-worthy! Congratulations for aiming high!